Neosaurs game is the first of massively multiplayer RPG, MMORPG browser games from Microsoft. 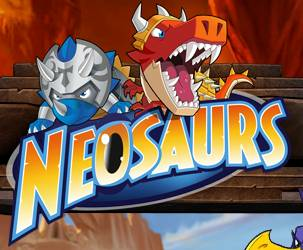 Players can play Neosaurs online for free using their web browsers. One interesting feature of the Neosaurs game, Facebook users can also play Neosaurs. Neosaurs is the strongest candidate to be the best Facebook game nowadays. Neosaurs game has some new features for most players as well as for Microsoft. If as a game player, you play Neosaurs using your web browser. Neosaurs is a browser game. This means you do not download executable binary game files, patches, extensions, etc. There is not a Neosaurs download, all is in the web. No executables, no patches, no updates, no files to download Neosaurs. You will not wait just point your web browser to Neosaurs online game portal URL and click "Play Now" to start this first MMORPG browser game from Microsoft. You don't even bother to register Neosaurs game website. Players can start playing Neosaurs browser game using their existing Windows Live account of Facebook account. Neosaurs free to play multiplayer browser game is basically a 2D fantasy MMORPG game which enables Neosaurs player to complete challenging quests, fight with numerous monsters from evil. The Neosaurs web browser game takes place on an imaginary Sauria land where Neosaurs live. The first thing the game Neosaurs players will have to do is to create Neosaur of their own. Each user can customize a house for its dinosaur by decorating with furniture as your wish and with item gathered during quests and explores in the new world. Then players can get Quests from NPCs existing towns of the Neosaurs World. When the players successfully completes a quest, then player will earn gold, EXP, items, etc from the quest NPC. Your Neosaur will have skilld that will be helpful to your Neosaur during the game activities. These neosaur skills may vary from special attacks and capabilities during battles to healing and removing status effects from your friends. Just a Skill Monitor, Neosaurs game players will be able to view their skills in detail using Skill Window. Of course there are monsters in dungeons deep under the surface of the World that makes game more difficult and exciting for our Neosaurs. With each increasing difficulty level the monster will become more difficult to beat by yourself alone. Do not forget Neosaurs game is a massively multiplayer RPG (MMORPG) browser games. The Neosaurs will require to accompany others with higher skill levels to beat monsters in higher difficulty levels. When the new baby dinosaur is born, it will have time to decide which type of an Neosaur will it be. Until your Neosaur reaches skill level 10, it can use skills from three classes. These three classes of a neosaur : Rex, Cera or Ptera. Each Neosaur class has properties and features specific to itself. In order to learn details about classes in Neosaurs : Rex, Cera, Ptera, please refer to how to choose class of your Neosaur in Neosaurs game guide. When a Neosaur is level 10, then as the guardian of your Neosaur you will decide the class which it will evolve to. While exploring the Sauria land and during your quests, a Neosaur can collect equipments and items for its inventory. These items and equipments will help alot during the battles and quests in the Neosaurs game. There are also markets selling items and equipments and masters serving with their knowledge the Neosaurs. These are caleed Shop NPC in general. For example a skill trailer helps Neosaurs upgrade their skills and acquire new skills. Until a Neosaur reaches level 10 and has completed its evolution to a Neosaur class (Rex, Crea, Ptera) the Baby skill trainer Didi helps Neosaurs to learn new skills. For more information please refer to how to buy new skill in Neosaurs game guide. There are Armor Shop, Grocery Shop, Potion Shop and Storage Managers as well. The only Armor Shop is located in Moonglow town and not every dinosaur is given permission to buy a weapon from the armor shop. In this free to play MMORPG browser game, one of most important thing is to get friends and form parties to accomplish your Neosaurs tasks successfully. The game has a very good chat interface which enables you to meet with other Neosaurs guardians, build friendship and create parties to complete quests against dangerous monsters of the beneath world dungeons.